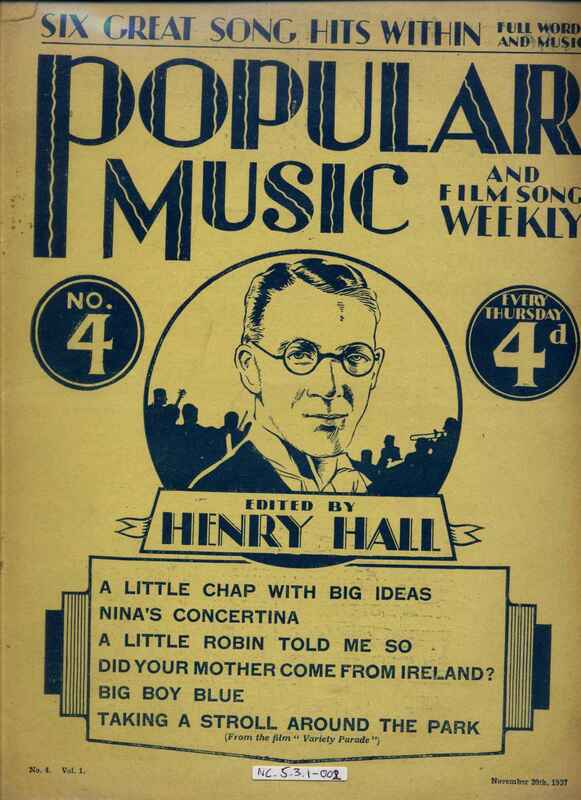 Full Description: Three Issues of the weekly “Popular Music and Film Song Weekly” magazine, edited by Henry Hall, and featuring full words and music of “six great song hits within”. Issue No 4 features “Nina’s Concertina – a novelty chorus song” (sadly supplied with chord symbols for the Piano Accordion!). Henry Hall (1989 – 1989) was a noted pre- and post-war Band leader, who composed for and played the concertina in his early career. His biography [ http://www.jabw.demon.co.uk/hhall01.htm ] also mentions his compositions for the Salvation Army, and Item NC.5.1.2-001 [http://www.concertinamuseum.com/NC50102-001.htm ] “The Musical Salvationist, Vol XXXVI, Jan-Dec 1922” includes three concertina solos arranged by Henry Hall (pp84, 60 and 108). His Autobiography is Item NC.5.1.2-002 , [http://www.concertinamuseum.com/NC50102-002.htm] and includes mentions of his concertina playing and performing at pp 29, 31, 33, 38, 40 and 41.